I know some parts of the country are still building snowmen and the idea that spring is just around the corner couldn’t come soon enough. Well here in Seattle, we’ve been enjoying oddly warm weather. Which makes dreaming about planting that amazing garden a reality. My girls love gardening and digging in the dirt, and when we happened upon Old Manhattan Has Some Farms at the library a few days ago we couldn’t wait to get home and start talking about our garden. 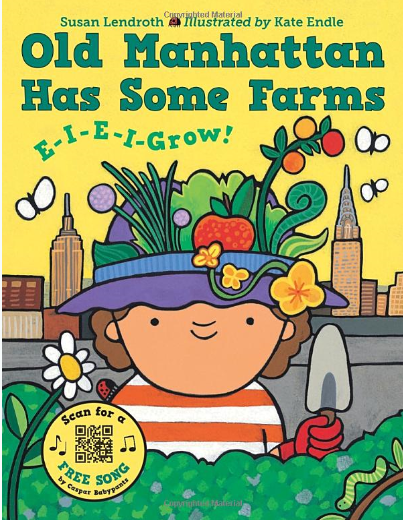 Old Manhattan Has Some Farms by Susan Lendroth and illustrated by Kate Endle is a book that is wonderful for so many different reasons. The book is based on ‘Old MacDonald Had a Farm’ which makes it incredibly fun to sing with your petites. It is educational – this book will teach your child about different kinds of gardens and how a garden can be grown anywhere. Giving them new vocabulary words that are so important for language development. This book has illustrations that highlight the diversity of the people who live in the different cities featured – we love a book with an illustrator that is able to capture diversity. We need more diversity in our books, especially our books for young children, so hooray for Kate Endle. Another reason this book is so special is it focuses on many different cities and the types of gardens one might find there; I am always a fan when one of my favorite places is mentioned in a book, even better if you happen to live there. The citites featured are Manhattan, Atlanta, Chicago, Toronto, Seattle, White House (DC). The message is that anyone anywhere can grow a garden no matter how big or small. This book is so much fun and the illustrations along with the singing make this a fantastic book for petite gardeners.